First of all, I am so sorry! Perhaps blogger changed a setting or two, but apparently there were 22 comments from you lovely ladies that I never published. Don't know how that happened. Usually they get emailed to me and I approve them on the spot. I'll have to tinker around and make sure this doesn't happen again. I can't tell you what it means every time I read "I love your blog". I love you, fabulous readers. You are the reason this blog was written. Secondly, Thanks to a fellow chefwife, Nina. I'm watching the last episode of Whites. 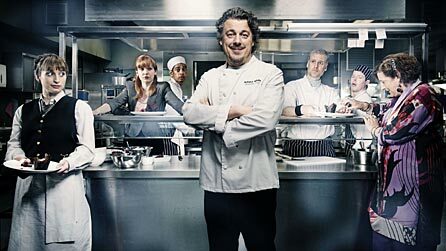 This BBC comedy is modeled after chef Marco Pierre White. If you like dry British humor, then 'ave a go! This mini, six episode series is currently running on hulu. I watched a couple episodes with my chef and we both agreed it was authentic. The characters are brilliant, I think you will especially love Bib. I think we are all married to him. And Kiki, well, she's just so Kiki. Last, but certainly not least, I've joined the masses and set up a twitter account. I won't lie, I was beginning to feel left out. So since I have ...drumroll...and grand total of....TWO followers (which include my 17 year old sister and her best friend) I'd love to have you wonderful women over there. I'm still getting the hang of it all, but at least I'm at the right lunch table now. Ahhh don't forget the series Chef! My chef and I are hooked and are watching all three seasons over again. Very similar to Whites. I've seen both and I think I like Chef! even better. You can't watch some episodes on youtube.